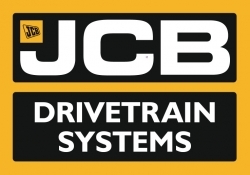 JCB Drivetrain Systems Ltd part of the JCB Group, supply Transmissions, Axles and Diesel Engines, within Integrated Driveline solutions or as individual components. Serving Original Equipment Manufacturers in off and on highway machine installations. With an ever growing product range primarily in 40kw to 130kW mobile applications, for the Airport and Airfield, Mining, Agriculture, Construction and Industrial market segments. JCB Drivetrain Systems Ltd is proud to have a significant distribution network with a customer base on 6 continents. Our endeavour is to provide you, the machine manufacturer with a comprehensive or partial solution to your driveline requirements and a world class service. Our products are well proven and our design and manufacturing facility second to none. One of JCB Drivetrain Systems many completely integrated Driveline solutions! Featuring 4 Wheel Steer through 2 driven powered steering axles, plus a 6 forward and 4 reverse speed Powershift Transmission with a 4 Cylinder 16 valve Stage 3 85kw JCB Dieselmax Engine. Ground Support Equipment O.E.M.’s can benefit from JCB Drivetrain Systems unique position of being able to supply from in-house manufacture the entire driveline of Transmission Axles and Engine. A wide range of variations are possible. JCB Drivetrain Systems Ltd even supply the cooling systems saving the customer significant resource and administration. 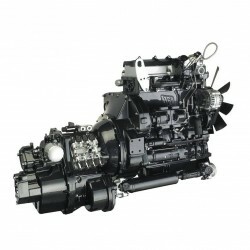 JCB Drivetrain Systems Ltd PS766 Powershift Transmission coupled to the 68kW JCB Dieselmax 444TC Engine. With up to 6 forward and 4 reverse speeds, this Transmission boasts an engine driven pump drive, an integral oil immersed park brake, with permanent or hydraulically dis-engageable 4 wheel drive and 2 wheel drive options. Also with the award winning patented Torklok lock up torque convertor feature. Also available are other Powershift solutions and also a variety of Synchromesh Transmissions. 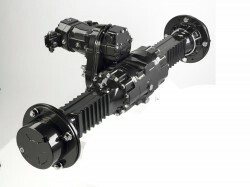 This Transmission is available on its own or mounted to the class leading JCB Ecomax or Dieselmax award winning engine. In Power ratings from 55 to 129kW,common rail electronic or mechanical injection systems, this power unit redefines engine technology and sets the standard by being available through Euro emissions levels stage 3b and Stage 4 final without the need for a Diesel Particulate Filter. 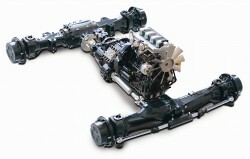 The Powertrain can be supplied with or without a Cooling pack. The smallest of our axle product range, this 40 series axle is rated at double reduction axle with final planetary drive. With oil immersed wet disc brakes it requires the minimum of maintenance. With options of a Hydrostatic motor mounted transfer box or direct mechanical input it is rated up to 9 tonnes dependant on the installation. Powered Steering driven and non-driven versions are also available, in a variety of ratios. The JCB Drivetrain Systems axle range extends far beyond this with 55, 70, 80 and 90 series. Rigid, steer and non-driven variants. Various track sizes and mounting configurations in addition to different ratios and braking solutions. JCB Drivetrain Systems have successfully installed products in a variety of Ground Support Equipment machines, Tow Tractors, Baggage Handlers, Loading Platforms and Ramps, as far afield as North America, Europe and Asia.Pictured here is the latest. 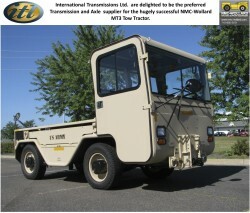 The NMC -Wollard, MT3 SATS Tow Tractor. This hugely successful machine has a Powershift Transmission, SD40 steer drive and a PD40 rigid drive axles. NMC-Wollard achieved U.S. Army certification for the MT3 with JCB Drivetrain Systems driveline at the Army’s oldest active test facility at Maryland’s Aberdeen Proving Grounds. Hundreds of machines are presently in use with the US Army, the US Coast Guard and a variety of civilian applications.